LinkedIn is the top social network site for business and employment-orientated purposes, but a new LendEDU poll revealed that the site may have some drawbacks, and even worse, deceptive practices amongst users. LendEDU commissioned a poll that asked a wide range of respondents a few questions about LinkedIn, the Facebook-esque site used for business networking. 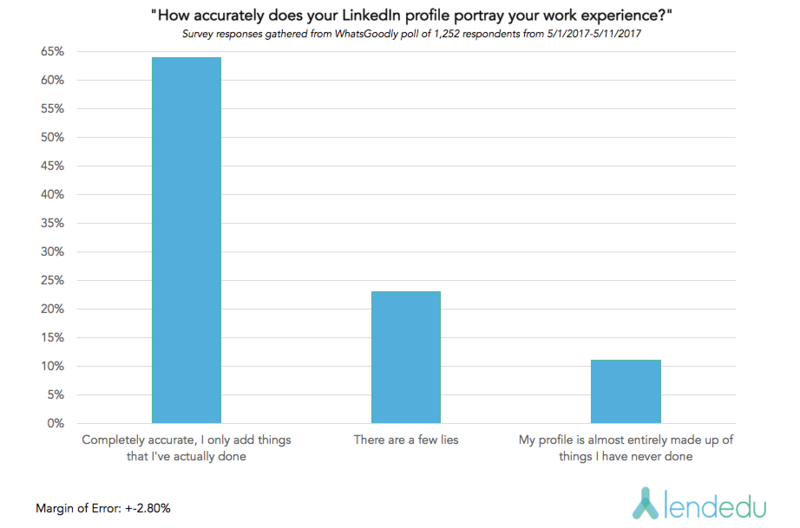 According to our poll, some LinkedIn users were deterred from looking up potential colleagues because of one unique feature on the site. 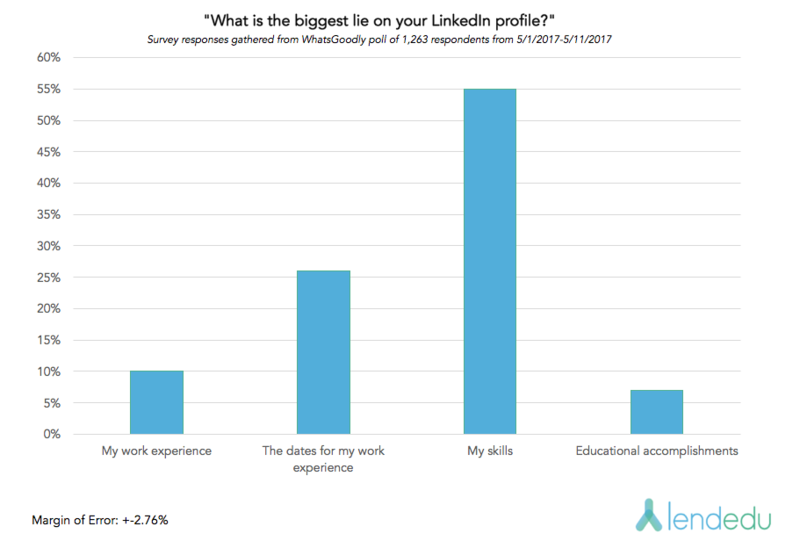 Additionally, quite a few respondents were prone to lying on their LinkedIn profile, especially when it came to one particular topic. The good news? Most people are being honest about their LinkedIn profiles and specifically, their work experiences. In fact, more people claimed their profiles were “completely accurate” than the other two options combined. Of course, the bad news is that there is still a significant portion of LinkedIn users who are entering false information. More than a third of respondents have either sprinkled in a few lies or have completely fabricated their entire profiles. It is to be expected that not everything you see on LinkedIn is the truth. People lie to get ahead, and they will continue to do so. This is especially true when it comes to work experience. Sometimes, if people’s actual experiences are not enough to land their dream jobs, they feel they must add in what the employer wants to hear. According to our data, this occurs with more than a third of LinkedIn users. So, what are LinkedIn users lying about? After it was established that a decent contingent of LinkedIn users were lying on their profiles, we wanted to find out what they were lying about. “My skills” received the majority of the vote at 55 percent. The second choice for respondents was “The dates for my work experience,” which received 26 percent of the vote. After the top two choices, “My work experience” registered 10 percent, while “Educational accomplishments” received 7 percent. It was interesting to see that “skills” received a higher percentage than the other three options combined. Lying about one’s skills is presumably a whole lot easier than falsifying prior work experience or educational achievements. This is because work experience and accomplishments in school can be cross-referenced for validity. There is no surefire way to verify that a candidate actually has the skills that he or she claims. Meanwhile, a simple phone call to prior companies or academic institutions will either expose a candidate as a liar or confirm his or her claims. But for skills, it is quite different. Job applicants can lie about their skills all the way to signing employment contracts. The only way to truly know if candidates are lying about their skills is to administer some sort of pre-hiring test that will verify their abilities. Otherwise, it is all hearsay. Here is a word of advice to employers. If a potential hires seemingly have all the skills you are looking for, approach with diligence. According to our data, there is a 55% chance that they are fabricating at least one of their skills. Perhaps it would be wise to require that applicants take a test to confirm their said skills, otherwise you will be left with employees that are either not adequate for the position or will require training, an expense that could have been avoided. One of the unique features on LinkedIn is that users are able to see who looks at their profiles, no matter how long or how many times they have looked it. A user will get a notification alerting them that this person has viewed their profile. However, there are ways around this. Users can switch their profiles to private so that connections only see that someone viewed their profile, but the name of the user is not provided. However, once the private feature is enabled then the user will not be able to see who views their own profile. There is some irony in the fact that a feature in a business networking website is deterring some users from visiting the profiles of potentially useful connections. 20 percent of respondents never visit other profiles solely because of this feature. Meanwhile, 38 percent said that this feature “sometimes” stops them. So, nearly two thirds of people are deterred to some degree by this feature on LinkedIn. That is a lot of missed networking opportunities. Aside from networking, that is a lot of missed opportunities for less experienced workers to see the qualifications they need to advance in their industries by looking at the “higher-ups” within their fields. 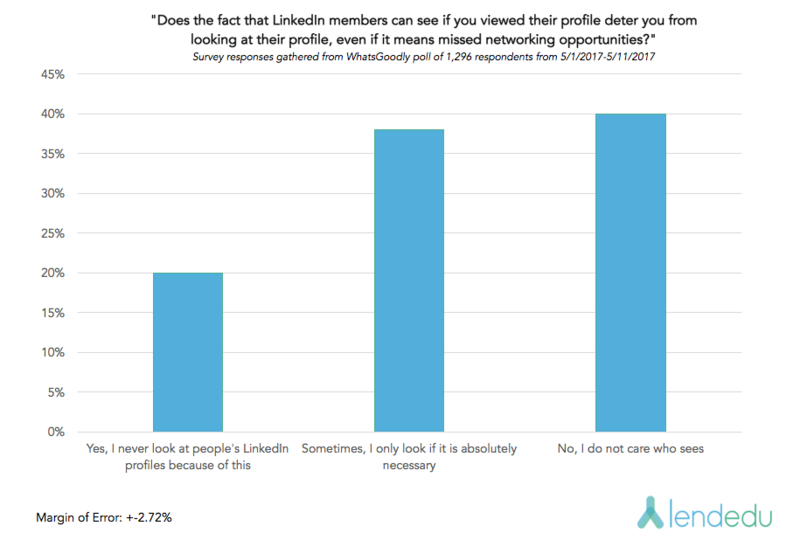 Most likely, LinkedIn users do not want to appear to be “stalking” the profiles of people in their business. Contrarily, LinkedIn could see this feature as a good way for people to meet each other, or at the very least, remember a face when it comes time to hire. However, that does not appear to be the thinking of many LinkedIn users. They are not thinking that the “Who’s viewed your profile?” feature is a good way to get their foot in the door, but rather a good way to get labeled as noisy. Users only seem to be thinking that they should save themselves the potential embarrassment of having people know they were snooping around their online resume, even if it means missed career opportunities. LendEDU has commissioned this poll from polling company Whatsgoodly. In total, 1,252 respondents were polled from May 1st, 2017 to May 11th, 2017 for the first question. For the second question, 1,263 respondents were polled from May 1st, 2017 to May 11th, 2017. For the third question, 1,296 respondents were polled from May 1st, 2017 to May 11th, 2017. We estimate that our sample is representative of the population within a margin of error of +-2.80%, +-2.76%, and +-2.72% respectively.